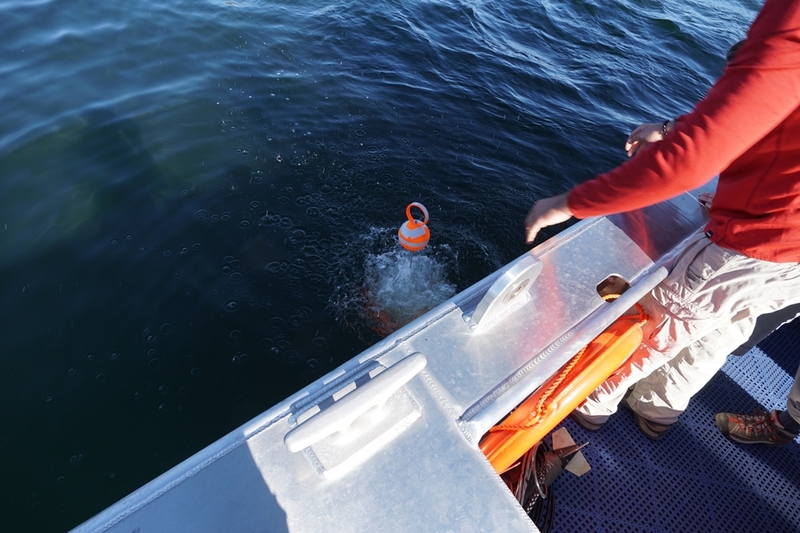 All 12 of the dual pressure and temperature (P/T) probes that were deployed on the Yellowstone Lake floor last year have been recovered! 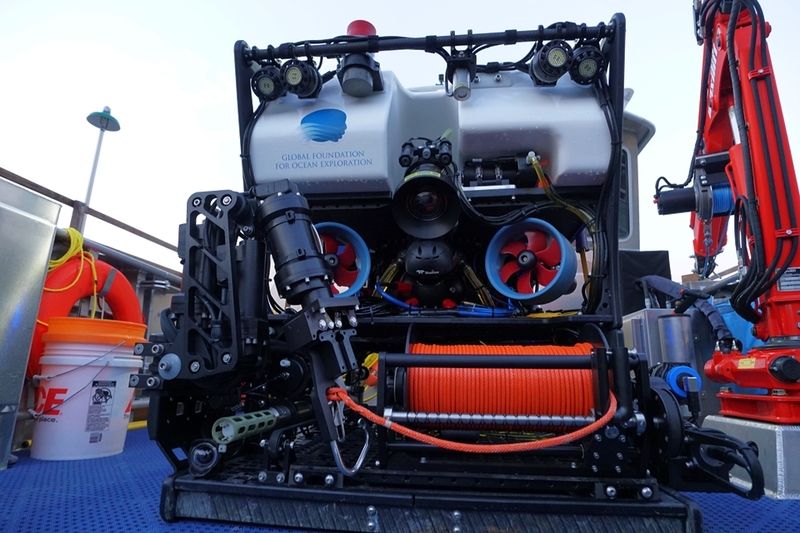 The majority of the recoveries were made while field testing Yogi, the new Remote Operated Vehicle (ROV) operated by the Global Foundation for Ocean Exploration (GFOE) for HD-YLAKE. This year, Yogi was outfitted with a new forward-facing sonar that allows us to detect objects up to fifty meters (164 feet) in front of us. This turned out to be extremely useful because as it turns out, visibility at the bottom of the lake is only about seven meters (23 feet). The sonar system worked so well that it was able to find a beer can that had been sitting on the lake floor! One unintended consequence of deployment of the P/T gauges was that the styrofoam crab floats used to keep the housings up right were crushed by the water pressure at the bottom of the lake. 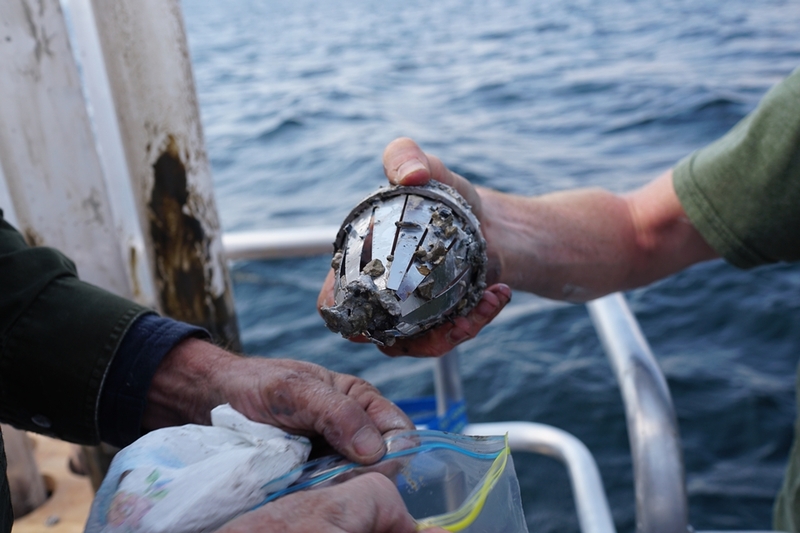 When inspecting the styrofoam floats, you can identify which housings were deployed at lower depths by how relatively crushed the floats are–the deeper the float, the more it was crushed. 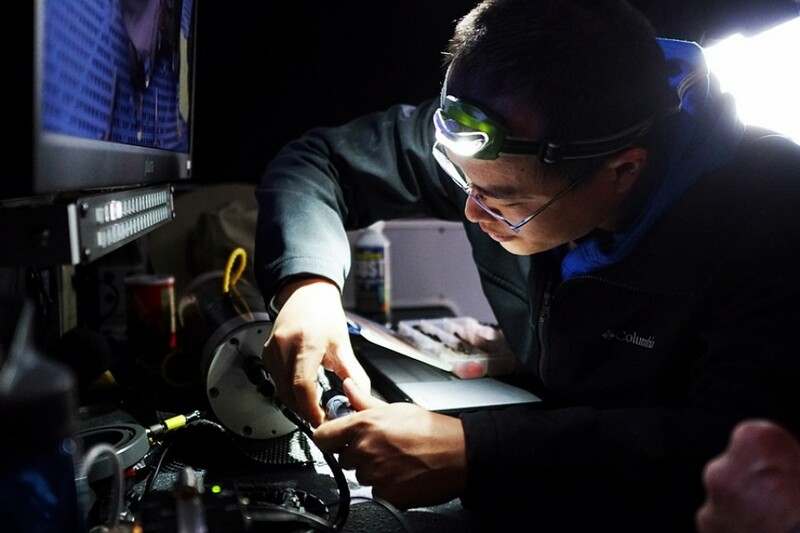 The data from the P/T gauges will be used to study ground surface deformation from hydrothermal charge and discharge, lake level, and other phenomenon such as seiche waves. Ground surface deformation occurs when the lake floor deforms or changes shape due to changes in hydrothermal activity. Seiche waves are similar to the sloshing back and forth of water in a bath tub. Karen Luttrell (Center) and her Ph.D. student secure the P/T gauge to the housing for deployment during the 2016 field season. Work was completed under an authorized Yellowstone Research Permit. 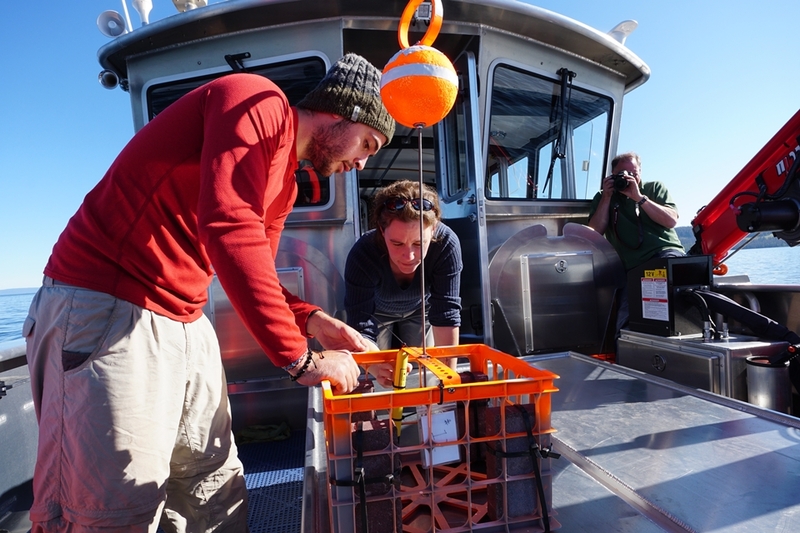 Louis Garcia deploying the sensor and housing to the lake floor. The floats at the top kept the housings upright during deployment. Work was completed under an authorized Yellowstone Research Permit. Closeup of YOGI, HDY-Lake’s ROV. The forward-facing SONAR is located in-between the two front propellers. Work was completed under an authorized Yellowstone Research Permit. Closeup of the crushed crab floats. You can tell that the one in front was deployed at a much greater depth than the second one by the level of crushing that occurred. Work was completed under an authorized Yellowstone Research Permit. Closeup of the crab float with the most deformation. The float’s original diameter was from the bottom of the PVC ring to the top of the washer. 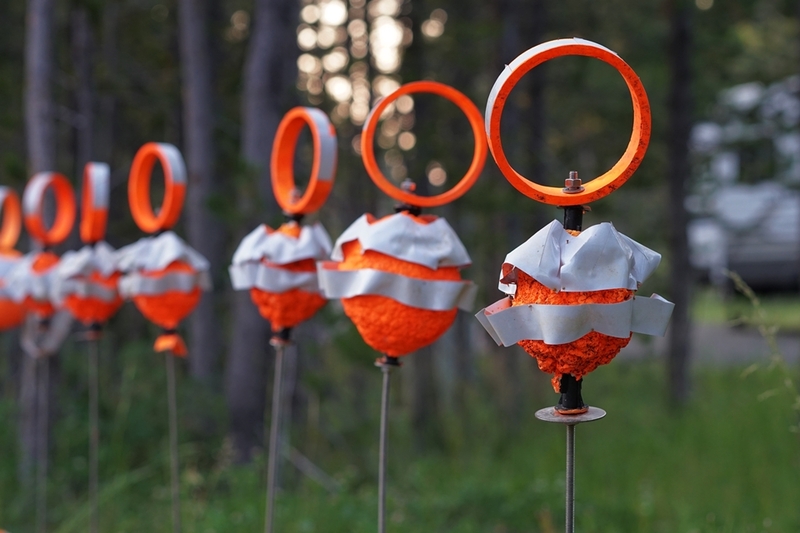 The retroreflective tape was pinned on last year to ensure it would stay attached. Work was completed under an authorized Yellowstone Research Permit. Today, Luke McKay, Bill Inskeep, and Pat Shanks collected gravity cores in and around the focus site northeast of Stevenson Island. 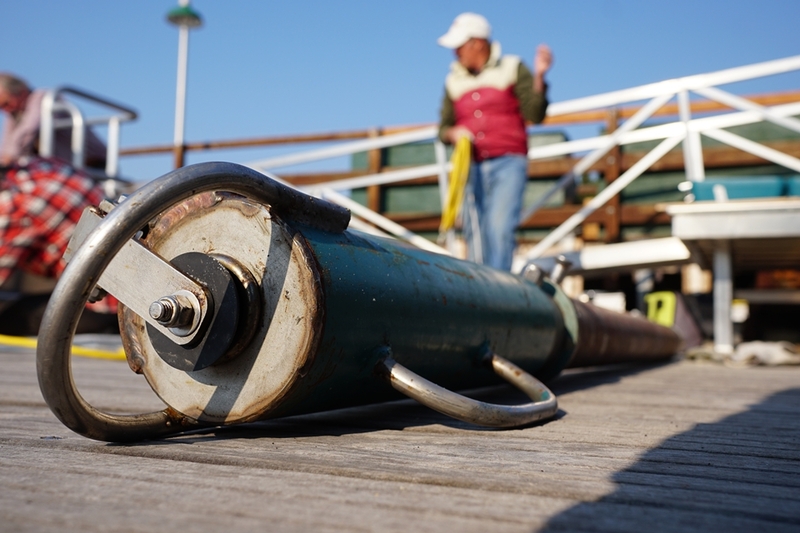 Gravity coring is a method that extracts a cylindrical mass of sediment up to two meters (6.5 feet) long by dropping a hollow, 100+ pound tube into the sediment from 5-10 meters (16-33 feet) off the lake floor. The downward momentum of the tube drives it into the sediment, filling the inner chamber with material that can be later used for experiments. 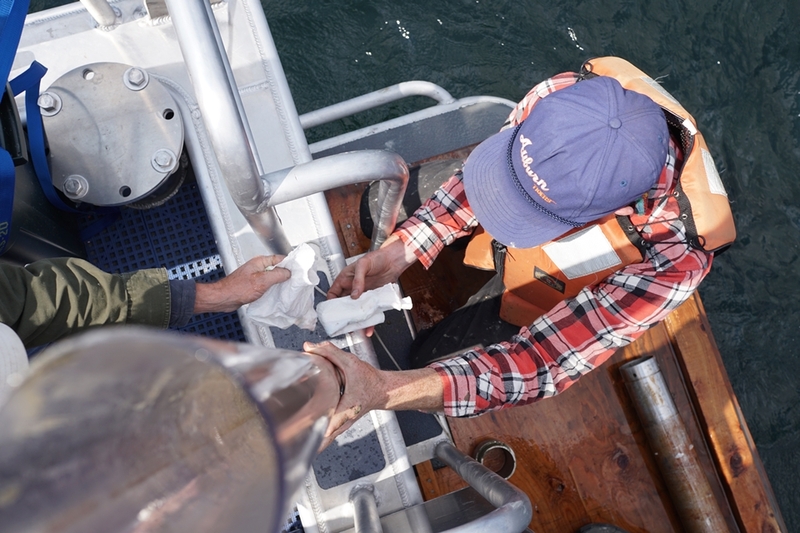 Before collecting any samples, the team first built a wooden covering to protect the back of the boat from the heavy coring equipment. Once the covering was installed, it was time to push off and head to the study site. The depths in this area range from 80 – 120 meters (262-394 feet), depending on what part of the venting field you are in. 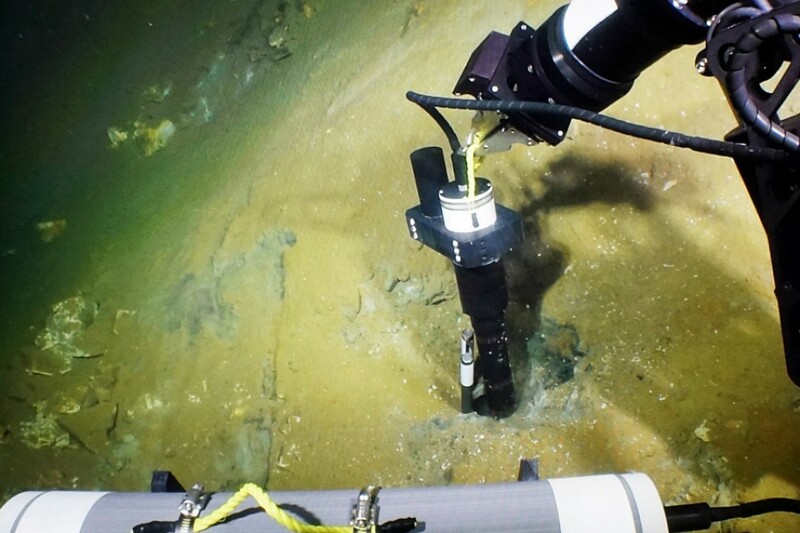 When we arrived at the first site we lowered the rig to 5 meters (16 feet) above the lake floor, let it free fall into the sediment, and raised it to the surface. The whole process took about 20 minutes. 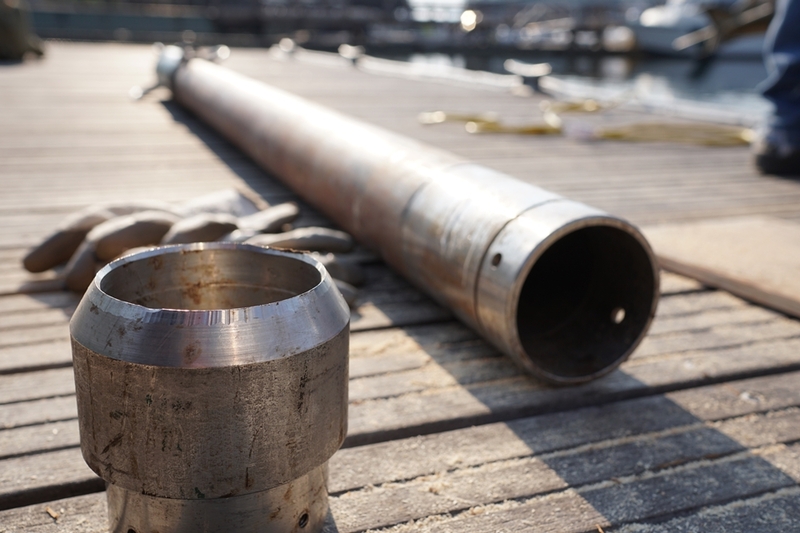 Everyone on the boat was hopeful as the inner tubing was removed from the gravity core to reveal that the first core had brought up … NOTHING. Another two attempts were made, altering the height from which the rig was dropped and even trying to slowly lower it into the sediment, which all came up empty. Luke, Bill, and Pat concluded that the sediments in the location were too hard to properly core. After much deliberation, it was decided that we would move on to the next site. 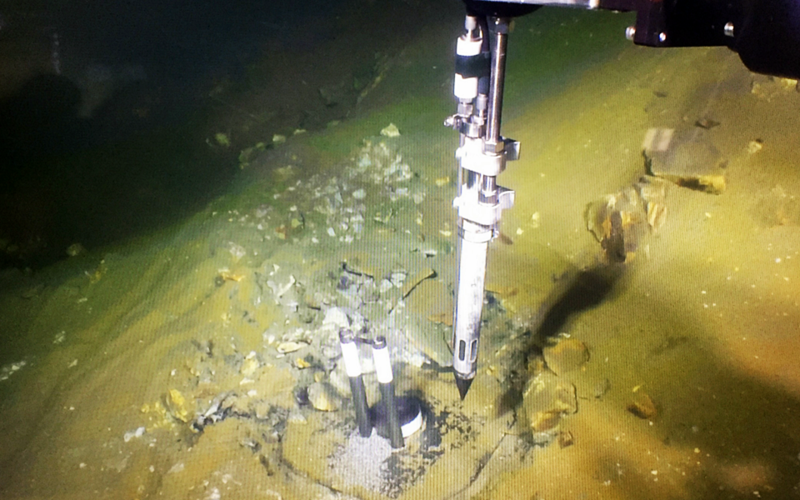 Once there we lowered the rig and dropped it at the new location, the coring attempt was a success! We recovered a core measuring about 40 centimeters (16 inches). 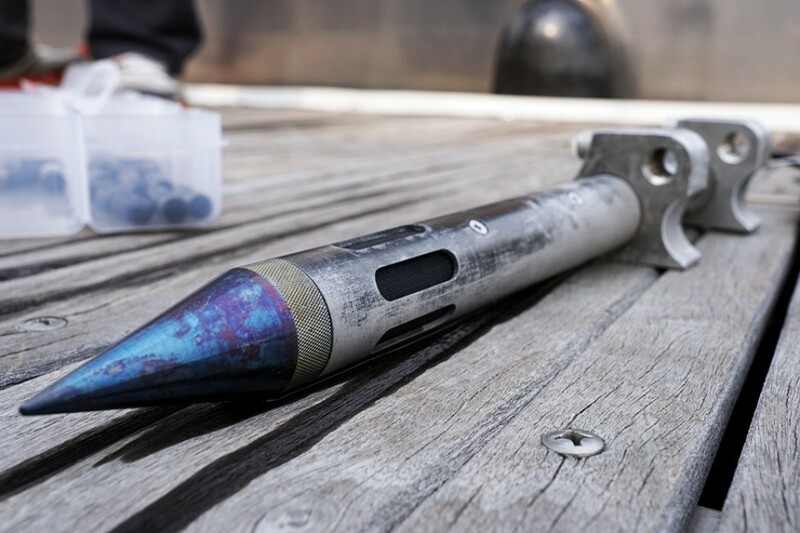 While the learning curve was steep for the day, the team recovered five cores, providing valuable data about the biology and chemistry of the venting field. 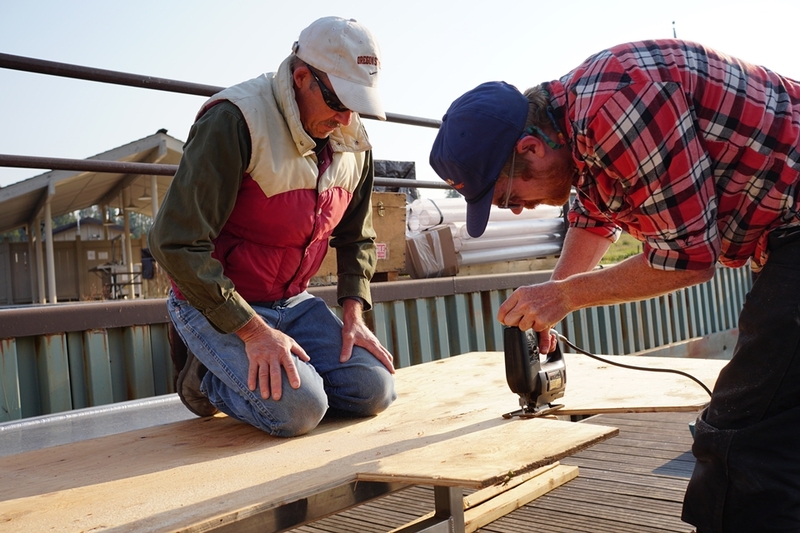 Luke Mckay(front) and Bill Inskeep(back) take measurements to build the wooden covering to protect the back step of the boat. Work was completed under an authorized Yellowstone Research Permit. The top of the gravity coring rig with the black valve at the top visible. This valve releases pressure as the core descends into the sediment to ensure as much sediment as possible is captured. Work was completed under an authorized Yellowstone Research Permit. The cutting edge of the gravity core (left). This round blade is used to more efficiently pierce the sediment and is quite sharp. Work was completed under an authorized Yellowstone Research Permit. Pat shanks recovering every ounce of sediment from the core catcher for later experiments. Work was completed under an authorized Yellowstone Research Permit. Luke McKay (right) and Bill Inskeep (left) inspect and clean the captured gravity core taken from a hydrothermally active area of the lake. Work was completed under an authorized Yellowstone Research Permit. 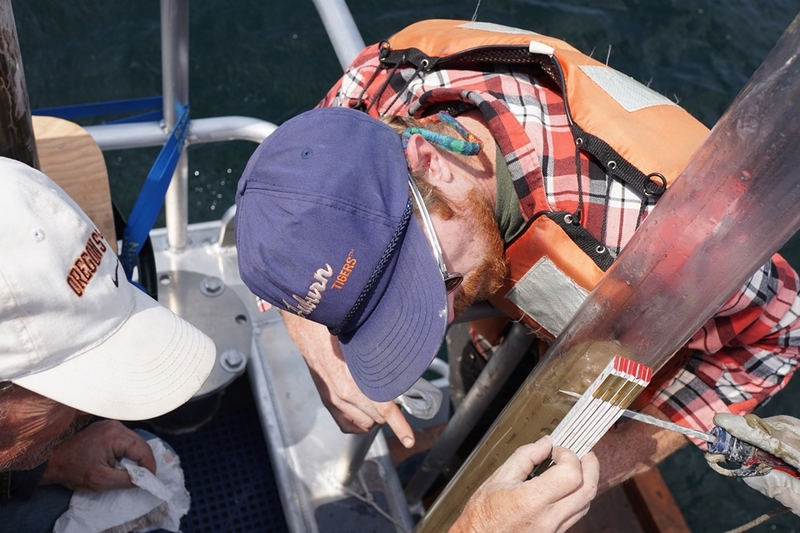 Bill Inskeep (left) and Luke McKay (right) measure the captured sediment core to record in their log book. Work was completed under an authorized Yellowstone Research Permit. Recovering the last bit of sediment from the core catcher. 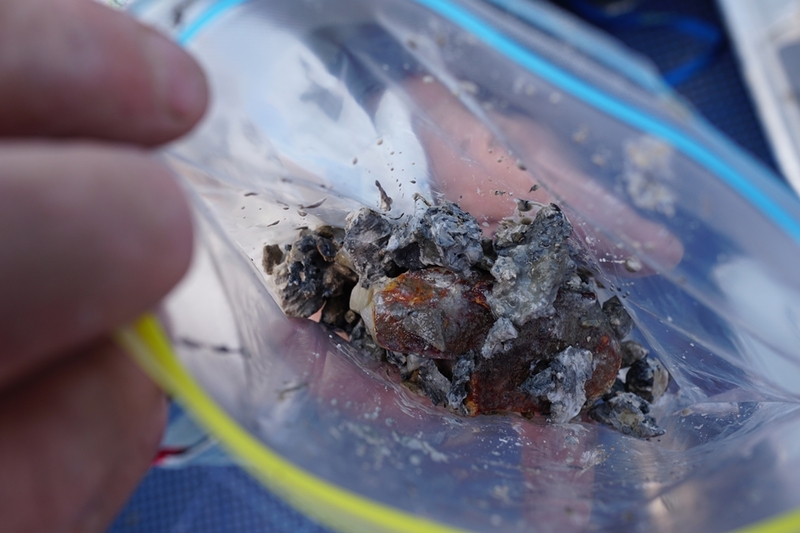 The hard sediment encountered, as can be seen on the catcher, prevented the core from fully penetrating the sediment. Only sediment from the catcher was recovered for this drop. Work was completed under an authorized Yellowstone Research Permit. 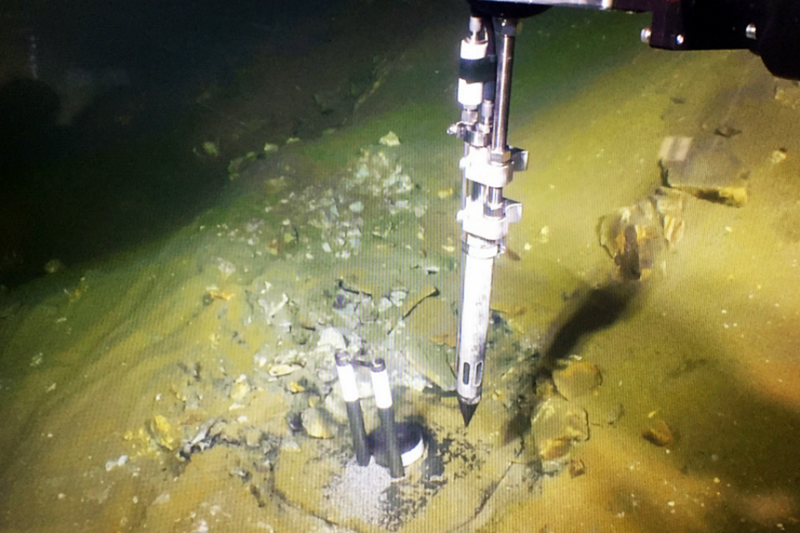 Hard, hydrothermally altered sediments from an active venting area make for awesome samples, but difficult coring work. Work was completed under an authorized Yellowstone Research Permit. This year HD-YLake welcomes two new researchers to the project. 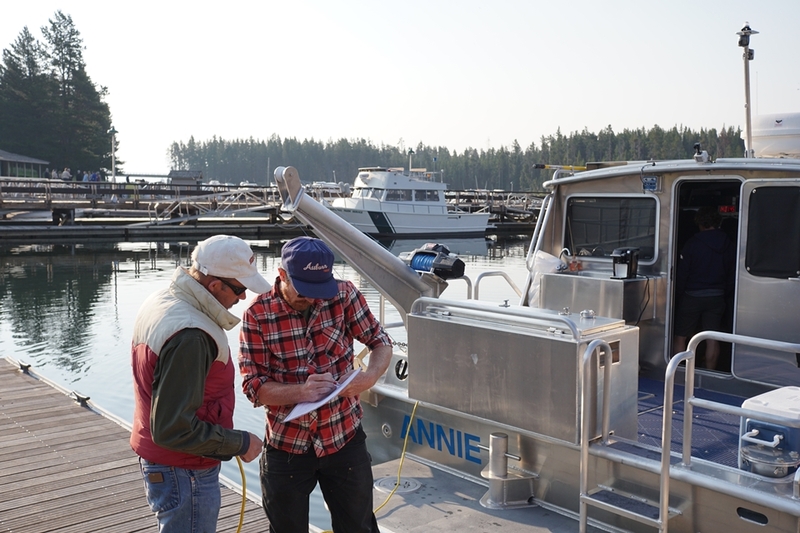 Bill Inskeep and Luke McKay are studying the microbial ecology of the sediments beneath Yellowstone Lake. Microbes, or ‘microscopic organisms’ are living things that are so small we need a microscope to see them. Examples include bacteria, viruses, and even tiny spider-like arachnids called mites. Ecology comes from the Greek word for “house”, and is the study of the interactions between organisms and the environment in which they live. 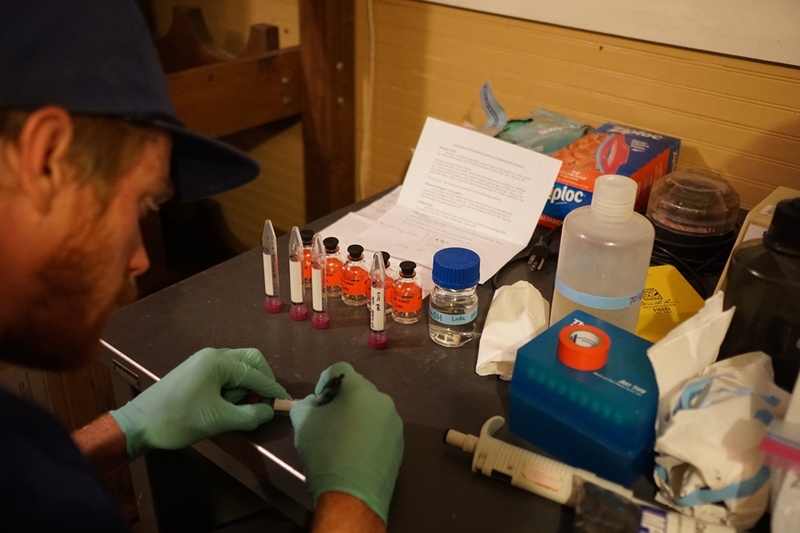 Bill and Luke are interested in understanding how the chemistry in different areas of the lake floor affects the microbial community and how the microbial community, in turn, contributes to changes in local chemistry. 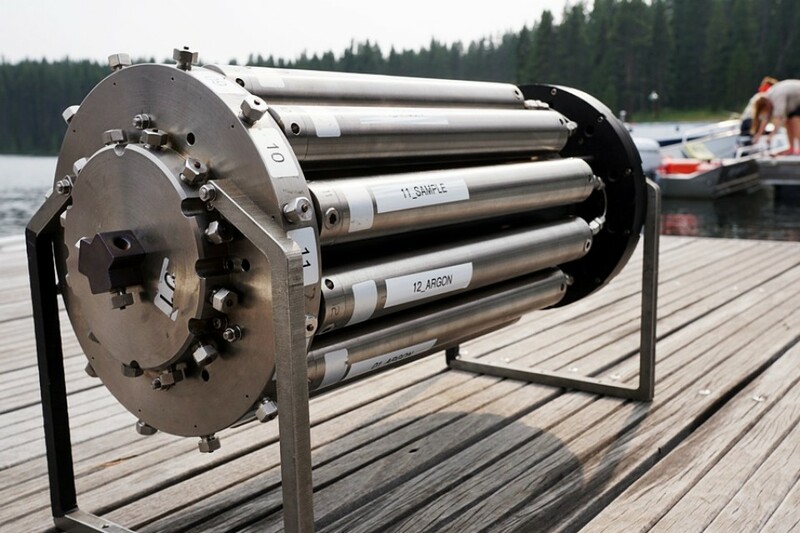 The Yellowstone Lake hydrothermal venting field is a prime example of an environment dominated by single celled organisms participating in transformative Earth processes like the carbon cycle. Their research will shed light on, for example, how these microorganisms get carbon from the environment and also what types of carbon they leave behind in the environment. 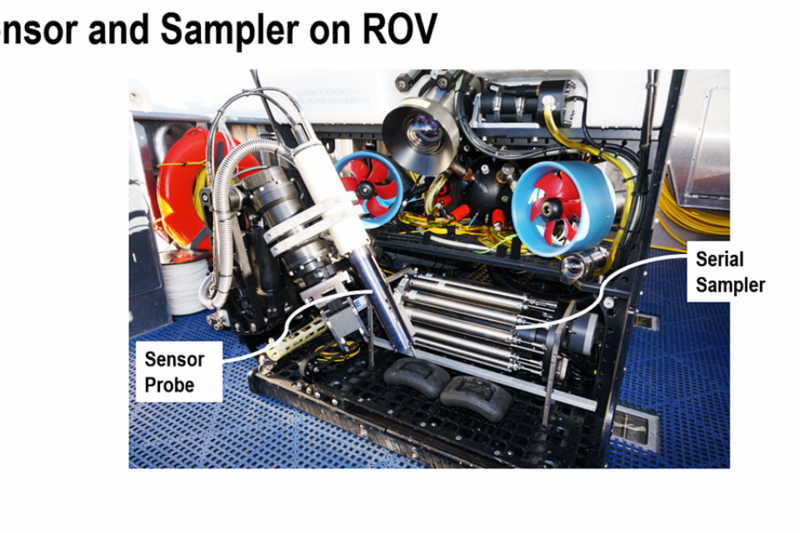 In addition, this research may reveal biochemical signatures from changing hydrothermal activity that could be used to identify past hydrothermal activity in other locations. 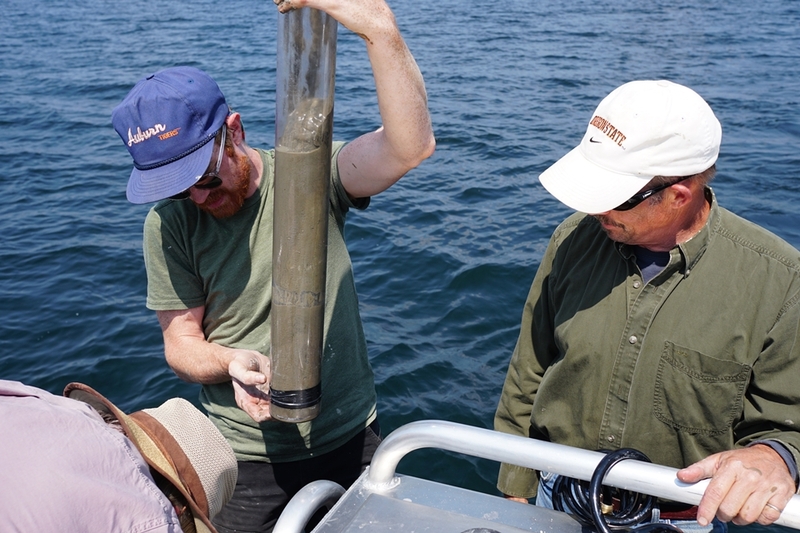 To perform these analyses, Bill and Luke are collecting shallow tubes of sediment, called cores, at sites on the lake floor with varying properties, like differences in methane concentrations, pH, or temperature. They will then extract the DNA from the resident microbial communities to examine their genomic potential for resource usage. 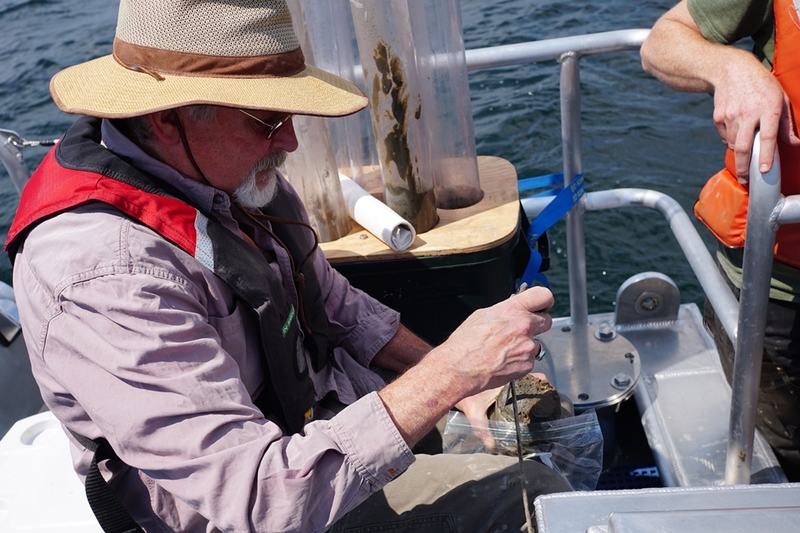 They will also analyze the chemistry at different depths in the sediments throughout the lake. 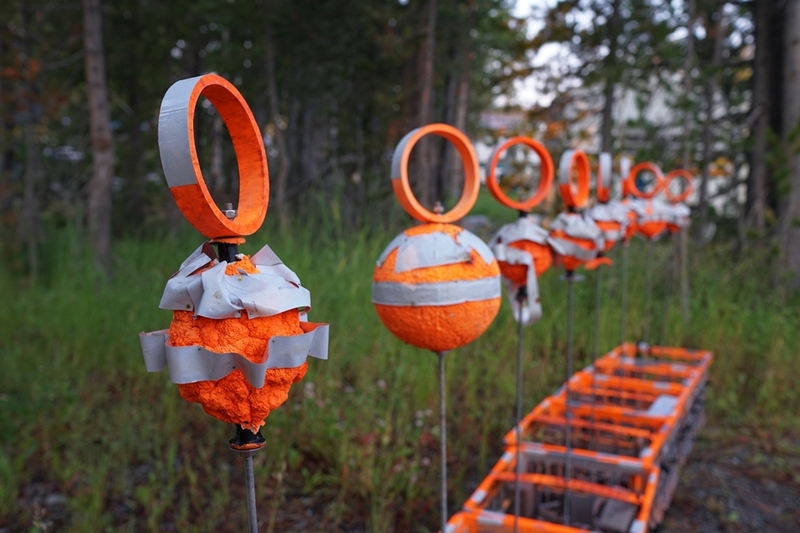 In this way, they will capture a three-dimensional profile that allows them to describe the overall microbial community and its relationship to the geochemistry of the Yellowstone lake floor. 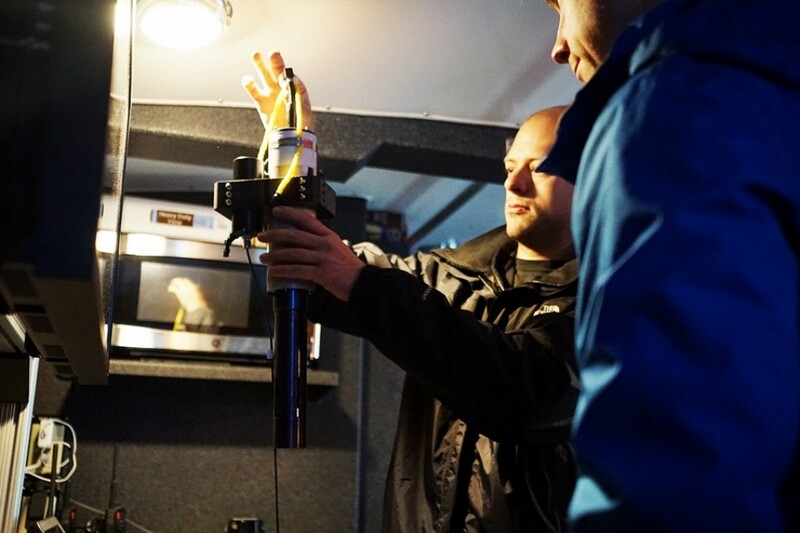 Bill Inskeep (left) and Luke McKay (right) work out the modifications necessary for the Annie to house their gravity coring rig. Work was completed under an authorized Yellowstone Research Permit. Bill Inskeep (left) and Luke McKay (right) sawing a piece of plywood that will be the protective covering for the back step of the Annie. Work was completed under an authorized Yellowstone Research Permit. Bill Inskeep (right) and Luke McKay (left) inspect and prepare a freshly taken gravity core from the venting field for transit. Work was completed under an authorized Yellowstone Research Permit. Luke McKay inspects a gravity core with a high sulfur content that is apparent from the strong odor. Work was completed under an authorized Yellowstone Research Permit. 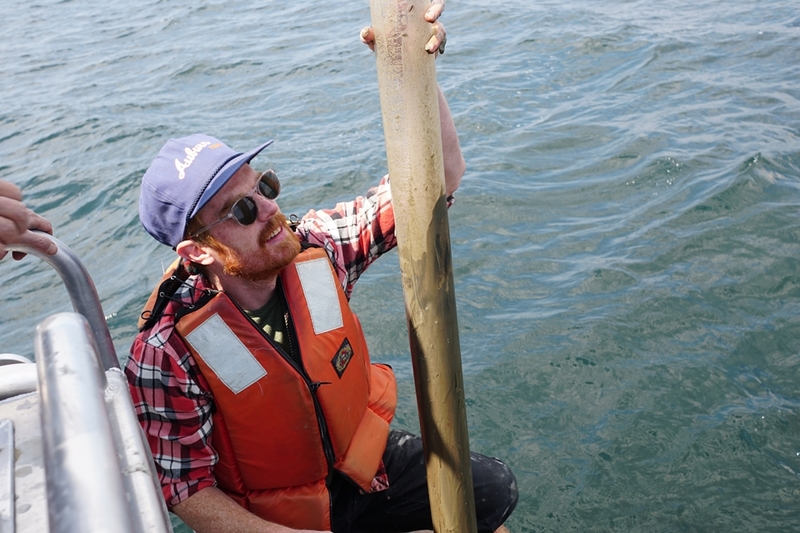 Luke McKay prepares solutions for the processing of the biological samples from the sediment cores. Work was completed under an authorized Yellowstone Research Permit.